Windows Server 2016 ISO download with 180 days trial period. 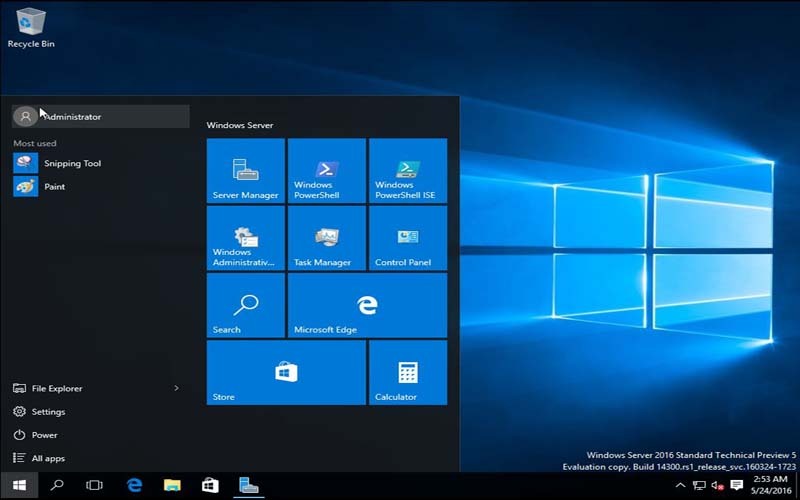 Download official untouched ISO of Windows Server 2016 evaluation edition free and safely. It is the cloud-ready operating system that delivers new layers of security, datacenter efficiency, and quickness in application development backed by Microsoft Azure, one of the world’s largest cloud datacenters. Windows Server Anti malware is installed and enabled by default in Windows Server 2016, but the user interface for Windows Server Antimalware is not installed. However, Windows Server Antimalware will update anti malware definitions and protect the computer without the user interface. If you need the user interface for Windows Server Antimalware, you can install it after the operating system installation by using the Add Roles and Features Wizard. 32 GB should be considered minimum space for successful installation. This minimum should allow you to install Windows Server 2016 in Server Core mode, with the Web Services (IIS) server role. A server in Server Core mode is about 4 GB smaller than the same server in Server with a GUI mode.